Is there an NBA team that is better positioned to tap into the sponsorship coffers of multinationals than the New Jersey Nets? The Nets last season acquired Chinese rising star, Yi Jianlian, will broadcast more than half of their games in China and now have a Russian billionaire as their majority owner. From the looks of things, the international outreach is paying off. Today, the Nets announced the renewal of sponsorships with four China-based companies and the signing of two new ones; Agricultural Bank of China and Yili. Below the screenshot, see the team's press announcement from earlier today. EAST RUTHERFORD, NJ—NETS Basketball has entered into signage deals with Agricultural Bank of China and Yili, a China-based dairy company. NETS strategic partner Beijing Womei Advertising Co., a top advertising agency in China, worked with the NETS in securing these new alliances. In addition, the NETS have renewed all four of their sponsorship alliances with China-based companies for the 2009-10 NBA season, including PEAK, Sina Corporation, Haier, and Nike China. Each deal includes extensive signage elements. “We are very proud to work with the NETS and to help them continue to build a significant partner base with companies in China,” said Dunhao Yang, the CEO of Beijing Womei Advertising Co. 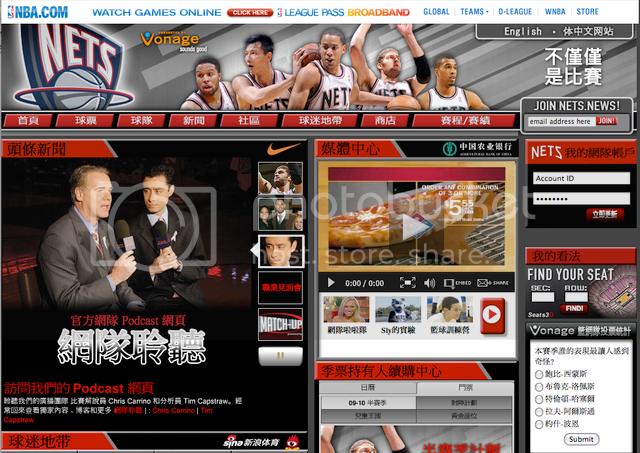 Soon after acquiring Yi, the NETS made their Web site, www.njnets.com, viewable in both simplified and traditional Chinese characters to give Chinese speaking fans the opportunity to connect with Yi and the team.